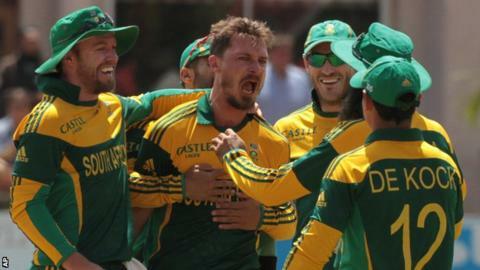 Dale Steyn took 4-35 and Faf du Plessis scored 96 as South Africa defeated Australia by six wickets in the final of the Triangular series in Zimbabwe. Aaron Finch top-scored with 54 and James Faulkner 40 as Australia struggled to 217-9 from their 50 overs. In reply, Du Plessis put on 98 with Hashim Amla (51) and 91 with AB de Villiers (57 not out) as South Africa won with nine overs to spare. In-form Du Plessis had struck three centuries in his previous four innings. Unsurprisingly, the 30-year-old, who almost became the first player to score four hundreds in a single series, was named man of the tournament. "I've been hitting the ball well and definitely number three is a position where I get the time to set up my innings," said Du Plessis. "I'm getting used to the role now and beginning to enjoy it." The World Cup takes place in Australia and New Zealand next year - and Proteas skipper De Villiers is confident his team can improve on their performances in Zimbabwe. "The fact we are starting to win games under pressure shows we are on the right track," said De Villiers. "But there is definitely room for improvement. "We will try to get things 100% for the World Cup." Steyn was in superb form for South Africa, damaging the Australian card with some superb reverse-swing bowling. Australia found themselves 144-8 before mounting a recovery of sorts to reach 217. "We were 70 to 80 runs short, but we were outplayed," said Australia captain George Bailey. "It was challenging to bat at the start, but once again, credit to South Africa, their spinners were tight and their top four almost all got starts."